Utah played its one and only exhibition game on Saturday, and the result was a mixed bag. The Utes began pulling away from St. Martin’s late in the first half with their athleticism and depth, and the final score was 91-54. Jordan Loveridge played well in the post, scoring 21 points and adding six rebounds. Delon Wright also impressed in his new role for the Utes, playing the majority of the time at the one but still grabbing eight rebounds. However, it was apparent that they still don’t have a second presence in the frontcourt, something head coach Larry Krystowiak needs to figure out before their first regular season game on Friday. Colorado wasn’t happy when the AP Top 25 poll came out on Thursday and the Buffaloes were left off it. The Buffs were fourth among Pac-12 teams in the AP despite coming in third, and even garnering a first place vote, in the Pac-12 Media Poll. Tad Boyle’s team isn’t too far out of the rankings, however, being listed fifth in the “Also Receiving Votes” category. Preseason ratings really have no meaning, but if you can use it as motivation for being snubbed like Spencer Dinwiddie is, more power to you. Colorado opens the season on Friday against Baylor in Houston. The annual NBA D-League Draft was held on Friday evening, and two former Washington guards were taken in the first two rounds. Scott Suggs was taken in the first round by the Santa Cruz Warriors, and Abdul Gaddy was selected one round later by the Iowa Energy. As usual, the entire Pac-12 made a strong showing at the minor league draft, with eight alums being picked throughout the 12 rounds. Former Arizona power forward Grant Jerrett was taken with the first overall pick by the Tulsa 66ers. More Wildcats, Kevin Parrom and Salim Stoudamire, was taken by Rio Grande Valley and Fort Wayne, respectively. In addition, a pair of USC forwards were taken in the third round, and the Springfield Armor took former Oregon big man Joevon Catron early in the fourth. Also taking place Friday night was Washington State‘s lone exhibition tune-up, and the Cougars handled Central Washington for a 93-56 victory. The Cougars debuted their new pressure defense for much of the game, making the Wildcats execute their offense on all 94 feet of the floor. Ken Bone‘s team also shot the ball well, making 33 of 66 field goal attempts. The race to replace all-everything forward Brock Motum is also underway, and while senior big man D.J. Shelton led the team in points, it was freshman power forward Josh Hawkinson that surprised the most. Only playing ten minutes for Washington State, Hawkinson grabbed eight boards and scored six points. That will definitely be a position battle to watch as Washington State approaches its regular season opener on November 8 against Cal State Bakersfield. Oregon State held its “Beaver Fan Jam” Friday afternoon before the Oregon State football game against USC, and a dunk contest highlighted the festivities. Junior forward Eric Moreland took second place in the contest, producing this nice tomahawk jam and an over-the-“car” dunk in the second round. However, it was freshman point guard Malcolm Duvivier that took home the inaugural slam dunk title. He won it with this 360 beauty, leaving Beaver fans hoping to see it in actual game action one day. Oregon State hosts Concordia to close out its exhibition season Tuesday night in Corvallis. 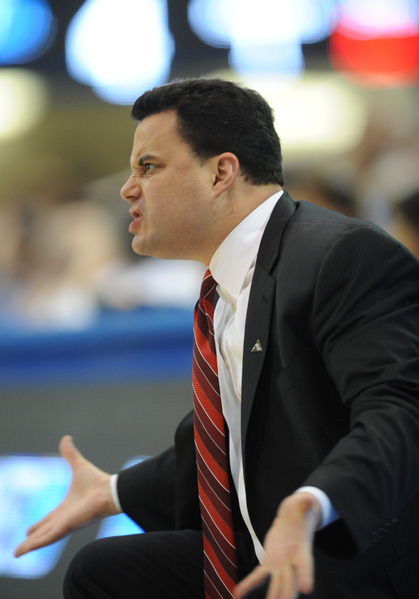 Sean Miller’s fifth season in Tuscon could easily turn out to be his best. 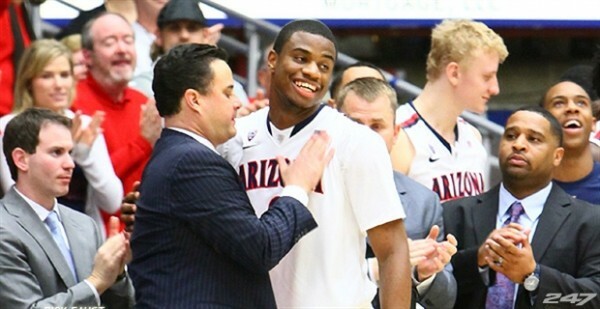 Despite the graduation of key seniors Solomon Hill (a first round pick in the 2013 NBA Draft), Mark Lyons, and Kevin Parrom – in addition to the surprising departure of freshman Grant Jerrett to the professional ranks, Miller has assembled the most talented roster that Arizona has seen in quite some time. A solid Pac-12 conference and challenging non-conference schedule will challenge the Cats’, but a nice blend of returnees and newcomers should give the man at the helm ample leeway to steer this storied program deep into March. Steve Alford issued a statement yesterday apologizing for the way he handled the Pierre Pierce situation at Iowa. Alford constantly defended Pierce at Iowa after he was accused of sexual assault even after Pierce pled guilty. When Alford took over at UCLA last week, the topic came up once again when Dan Bernstein published a column entitled “Alford already lying at UCLA”. It was the right move for Alford to apologize, but it didn’t make sense that he waited nine years to do so. The Pac-12 has launched an independent review of the officiating that occurred at the Pac-12 Tournament this year. Even with Ed Rush’s resignation, the conference must determine whether the officials were influenced by external factors during the games in Las Vegas. Additionally, the review will focus on how to improve the officiating overall — a recurring hot topic among league fans. This is a step in the right direction for the Pac-12 given the inconsistent and often very poor officiating that occurred this season. Standout freshman Jahii Carson will return for another year at Arizona State. Carson was not going to be a lottery pick in this year’s draft and still needs to improve his jumper and scoring ability against bigger guards. With Carson’s return to Tempe, the pressure now will be put on Herb Sendek to produce results with his team. While Sendek has been in Tempe, he has only made the NCAA Tournament once in seven years, and that simply won’t cut it. The Sun Devils will lose Carrick Felix, but they return Jordan Bachynski and Carson and will need to make a run at the postseason. Tad Boyle said yesterday at his season-ending press conference that Andre Roberson is getting “misinformation” that may be preventing him from deciding on whether he will declare for the NBA Draft. Many projections have Roberson going in the second round and some have him possibly not even getting drafted at all. Boyle noted that this is a very different situation than that of Alec Burks two years ago, where it was almost certain that he would get picked in the lottery. There’s a lot more risk for Roberson as a result. If Roberson does decide to leave school, Colorado will be prepared to move on. The Buffaloes will return four starters, have a deeper bench, and bring in three talented recruits. If Roberson decides to stay, there will be a spot for him in the lineup and the Buffaloes could potentially be a Top 15 team with the 6’7″ forward around for another season. Kevin Parrom’s career at Arizona has officially ended. Parrom tweeted recently that he won’t apply for a waiver request that would grant him a fifth year of eligibility. There was a slim chance of this happening as Arizona was expected to appeal and include the adversity Parrom faced as a main reason for the player to receive another year. Parrom was shot and lost his mother and grandmother as well within a short period of time in 2011. In Parrom’s final season, he averaged 8.3 points and 4.9 rebounds per game — although he is unlikely to make a roster in the NBA, he certainly has the ability to play overseas somewhere. How Far Can Arizona Go? Three weeks ago, coming off an 0-2 road trip to Los Angeles, Arizona was just about ready to be left for dead. It’s not that a pair of conference road losses – one to a team in the middle of a 6-2 streak, the other to the eventual conference champion – were egregious, it’s that they were playing uninspired ball and none of the pieces were showing great cohesion. Mark Lyons was 6-of-24 that weekend with three assists while getting outplayed by Jio Fontan and Larry Drew II; Nick Johnson was in the midst of his regularly scheduled mid-season downturn; and Sean Miller could seemingly never get more than one of his freshman bigs – Kaleb Tarczewski, Brandon Ashley and Grant Jerrett – to play well at any given time. Sean Miller Has His Wildcats In The Sweet Sixteen, But How Much Further Can They Go? 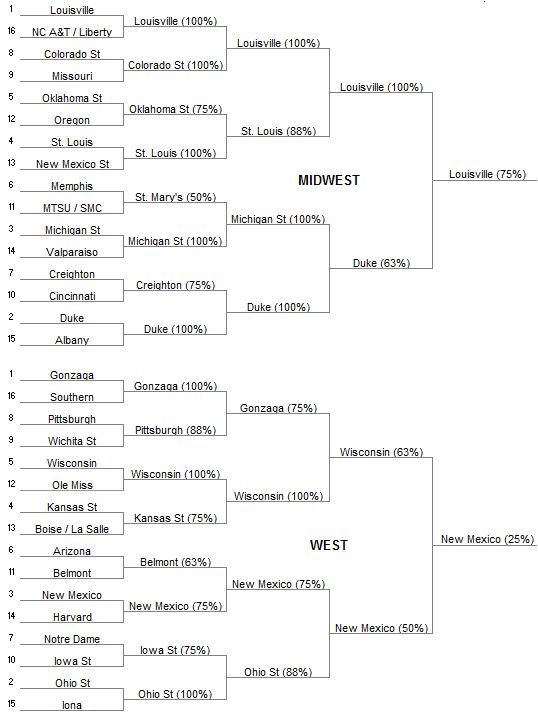 Flash forward to the first weekend of the NCAA Tournament. Against a pair of physically overmatched opponents, Lyons was among the best players in the nation, going for 25 points per game in a highly efficient manner. Johnson is now in the midst of a string of unbelievably good defensive performances (dating back to the season finale against Arizona State) and looks to have regained his confidence in his jumper. The freshman bigs have suddenly shown strides to the point where it looks like at least two out of the three can be counted on in any given game. In other words, Miller’s got this team coalescing at precisely the right time. But still, like we said, those two tournament wins were against seriously overmatched teams. Just how far can this Wildcats team go now that the strength of the opponents are about to undergo a serious uptick? Pac-12 Burning Questions: Most Memorable Moment? What has been your favorite moment this season? Adam Butler: The best moment is one of my favorite questions. Certainly at a time of year (I think I’ve used that as a lead like 200 times thus far in just one week of March) when just a single moment can define so much. But across the course of about thirty games per team, over wins and losses, ups and downs, there have been so many. Cobbs, Gordon, and Drew II have all beat the buzzer. Chen tried to. The conference had its first matchup of ranked opponents since March 2009. Game Day visited the Conference and Bill Walton grabbed the torch (or bullhorn) of touting the Pac’s return. There’s been so much to enjoy all the season long and, to be completely honest, the year’s most memorable moment is yet to come. 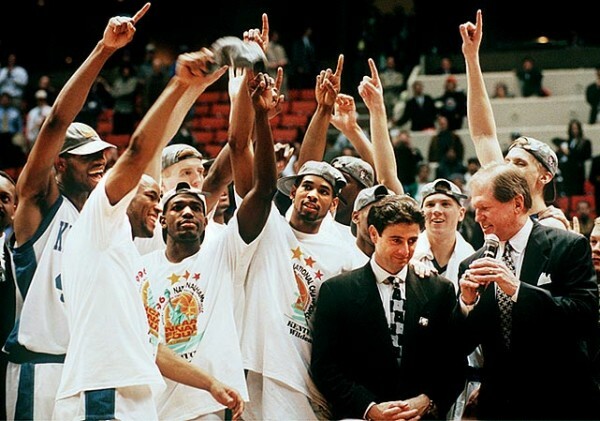 Something is going to happen inside the MGM, or someone is going to do something in the Dance we’ll talk about for years to come, “Remember when…” But to that effect, I’m going to make the homer pick. Because as Arizona had the improbable opportunity to take the lead at home against Florida, I was squatting on top of my couch. I had two friends locked in arms to my left and an air of tension thicker than Kaleb Tarczewski. The Lyons floater fell and we (in my apartment and in Tucson) went controllably wild. And then the backboard went red and we went uncontrollably wild. My kinda moment.